Flickr have at long last decided to release an upgrade to their users. The upgrade is currently only visible if you’re logged in to Flickr, but will be rolled out to all visitors in the coming weeks . There are many improvements, but the ones I like best are a larger default size (up from 500 to 640 pixels) on the photo page and a new light box mode for viewing photos larger. But I can’t help wondering why they didn’t go for at least 720 pixels while they were at it. Or why not – since this is 2010 – a design that adapts the photo size to the browser window, à la Picasa? Perhaps that wouldn’t make it possible for Flickr to apply their magical sharpening that gives all Flickr photos that crisp look. The new page seems to be designed to fit into a 1024×768 screen. If that is a requirement, then I just wish they’d spend a few more pixels on the photo and a few less on the right hand column. Are we going to have to wait another 6 years for the next size increase? Basically it is a response to the View large on black link that many users have been adding to their photo description. This is better though. It has a dark grey background, and buttons to move back and forward through the photos. It also has a play button that gives you a simple slide-show. The old (Flash) slide-show is still available though. One thing that has nagged me for quite some time is the fact that the 1024 pixel images look soft, especially in comparison to the medium 500/640 pixel size. I’d really like them to apply a little sharpening to the 1024 pixel images too. To sum up, some great improvements. 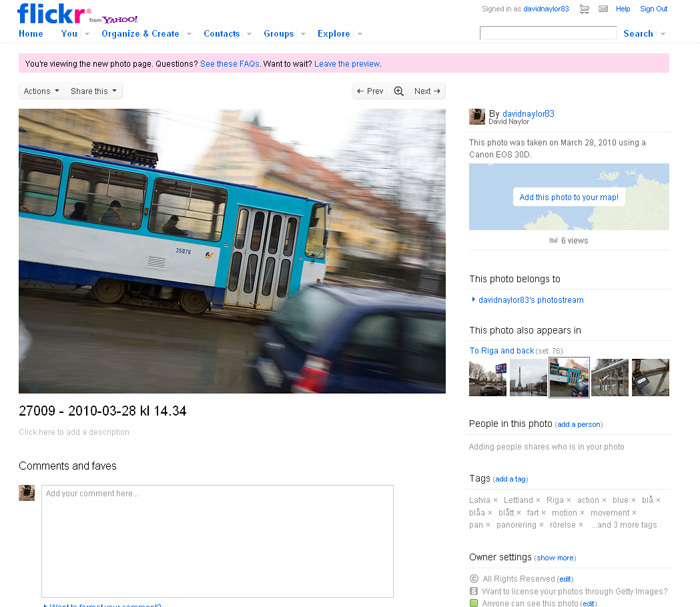 They’ve really identified Flickr’s weak spots, I just wish they had done even more to fix them. Posted at 22:13. 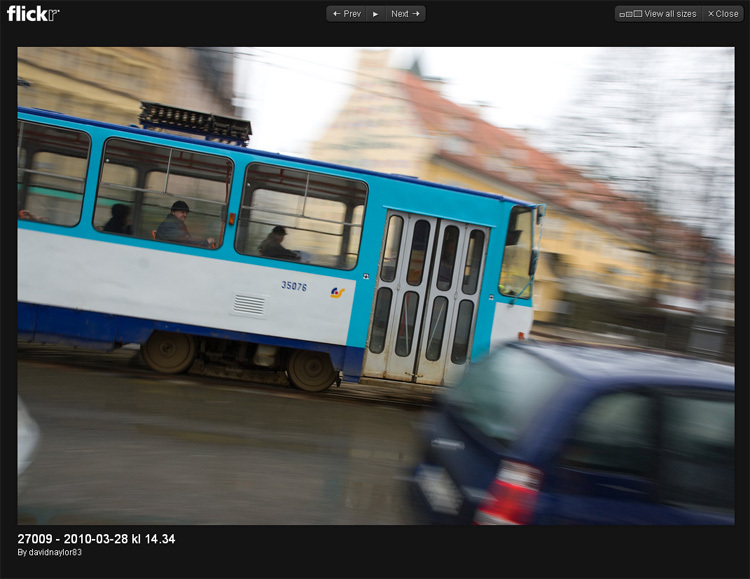 Tags: Flickr. Categories: photography. Both comments and trackbacks are closed. I came here to discuss how disappointed I am that the free account no longer supports the 1024 size, (down to 640)… Yet for you apparently an increase from 500 to 640 has happened. I’m in the U.S., where are you? Is this the difference? I’m getting ready to dump Flickr.